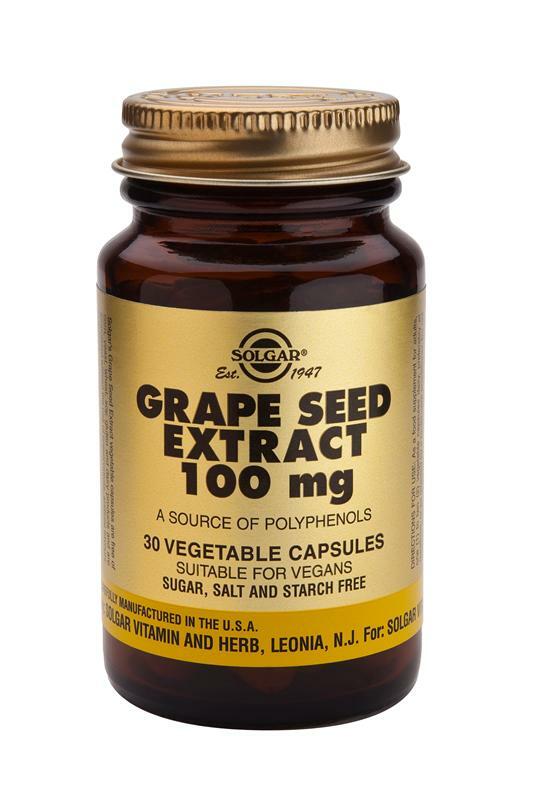 Solgar Grape Seed Extract 100mg - Grapeseed Extract helps maintain Antioxidants health. It contains naturally occurring bioflavonoids. Grapeseed Extract helps maintain antioxidant health. It contains oligomeric proanthocyanidins (OPCs), which are naturally occurring bioflavonoids. Grapeseed Extract contains typically 95% phenolic compounds such as oligomeric proanthocyanidins, monomeric polyphenols (catechins, epicatechin and epigallocatechin), organic acids (citric, gallic, epigallic acid and malic acid). As a food supplement for adults, one (1) to two (2) vegetable capsules daily, preferably at mealtime, or as directed by a health care practitioner.